2. Mix plenty of dye. Make at least 1 cup of each color you want to use (2 packets / cup). 1. Weigh out the yarn or fiber while it is still dry. Begin with 4 oz to 8 oz (113g -227g). Always dye more than you think you will need. 2. Make your yarn into skeins. Tie the skein in at least two spaces, but tie loosely or you will end up with “tie-dye” marks. 3. Wet your yarn: Gently press your yarn into the water, pressing out any air bubbles. When the wool is completely wet and swelled to about twice its size it is ready to dye. Clean wool becomes wet really quickly. 1. Add 2 teaspoons (10mL) vinegar to one gallon (3.8 L) water. 2. Test the pH of the water it should be around pH 4. If it is not adjust it as necessary. This will make sure the yarn dyes evenly. 3. The vinegar solution can be stored indefinitely. 1. Place the prepared wool in a large pot with a flat bottom. 2. Add vinegar solution to a depth of at least 1 ½” (3.8 cm). Although you could use less water, it would be hard to control the temperature. Using enough liquid is essential for good results. 3. Turn your stove onto the lowest temperature and slowly bring the dyebath to about 190°F (88°C). There will be steam, but no bubbles rising. Strawberry in ½ cup (120mL) Lemonade for a cool peach color. Have them ready in containers that pour easily. 5. When the dyebath is simmering gently, start slowly pouring dye directly onto the yarn. Begin with lighter or brighter colors. 6. After adding a color, wait for the yarn to absorb the dye and the water to turn clear. This is called exhausting the dye. Then pour another color adding the deeper or more muted ones after the brighter ones have been absorbed. 7. Once the yarn has absorbed all the color you want, let it simmer gently for another 10 minutes. 9. Wash and rinse the yarn and let it dry. 2. Remember that colors mix as they overlap. 3. Remember that colors will lighten in the drying process. 4. If you don’t wait for colors to exhaust themselves they will tend to blend in the dyebath and will mute each other. 5. If the dyebath takes a long time to exhaust (absorb) check the pH and add vinegar if necessary. 6. 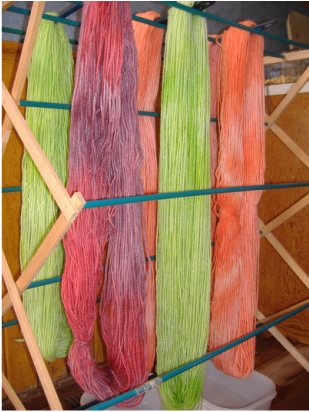 It is difficult to see color variations when working with dark wet colors, but they will show up later when the fiber is dry. See my blog for more dyeing ideas.